Iron furnaces provided one of the few industries in North Carolina prior to the Civil War. 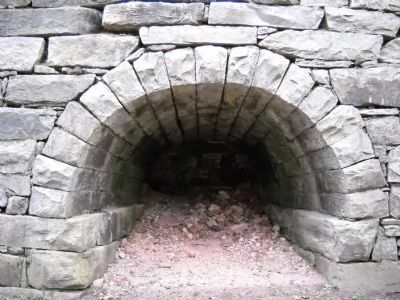 The Moratock Iron Furnace was built by Nathaniel Moody and John Pepper in 1843 for Moody’s Tunnel Works. The furnace is trapezoidal with a base of 28 square feet, constructed of rough-quarried granite blocks that are unmortared on the exterior. It has three fireplaces and was built up against a bluff so that iron ore could be sent over a bridge from the bluff straight to the top of the furnace. Iron ore and trees for charcoal came from local sources, including Rogers Magnetic Ore Deposits, and were used to make cast and pig iron. The iron was either hammered into bars or poured into casting molds. 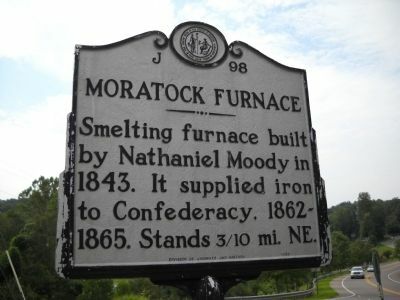 During the Civil War, the furnace was operated by Moratock Mining and Manufacturing Company and used to make swords and munitions by the Confederacy, who were cut off from outside sources of iron. Union General George Stoneman came through the area in April 1865 and burned the furnace’s outbuildings, putting operations on hold for a while. The furnace continued to operate intermittently until the 1890s and is one of only a few of North Carolina’s many 19th century iron furnaces that remain. 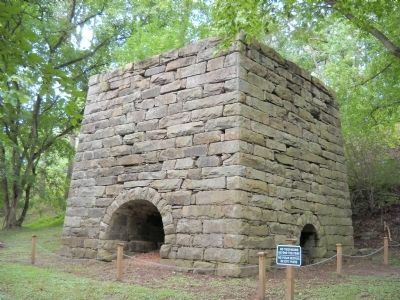 The Iron Furnace is now part of Moratock Park in Danbury, North Carolina.